Full Disclosure Network® is releasing the fifth segment of an on-going series entitled JUDICIAL BENEFITS & COURT CORRUPTION, in its' entirety, online for Internet viewers. The half-hour segment centers on the L.A. Times coverage of recent California court controversies, such as Judicial bias, disqualification and the case of jailed attorney Richard I Fine. The half-hour program is also featured on over 40 cable television systems in California, Washington D.C., Massachusetts, Wisconsin, Arizona and more. the Judge was biased having received illegal payments from L.A. County, an interested party in the case. As a part of an on-going series entitled JUDICIAL BENEFITS & COURT CORRUPTION, the Full Disclosure Network® presents the fifth segment in its' entirety, online for Internet viewers. The half-hour program is also featured on over 40 cable television systems in California, Washington D.C., Massachusetts, Wisconsin, Arizona and more. Watch Video online here. URL: http://www.fulldisclosure.net/Programs/541.php. DVDs are available upon request. A June 7, 2009 Los Angeles Times article entitled LAWYER TAKES A STAND FROM HIS CELL provoked response and criticism from supporters of jailed Anti-Trust Attorney Richard I. Fine who is being held in civil contempt of court for over 100 days following his attempt to disqualify L.A. Superior Court Judge David Yaffe from hearing a case where Fine contends "the Judge was biased having received illegal payments from L.A. County, an interested party in the case." (Marina Strand Colony II Homeowners vs County of Los Angeles). Featured in the video, taking the L.A. Times to task, are court critics Fred Sottile, John Rizzo who had been interviewed for the Times article. 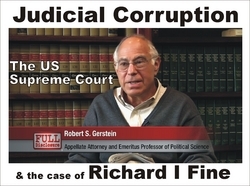 Providing background and perspective on the issue of judicial bias and the recent U.S. Supreme Court ruling in Caperton vs Massey is prominent Appellate Court Attorney, Robert S. Gerstein, Ph.D. who is an Emeritus Professor of Political Science at UCLA. He describes the recent case that overturned a West Virginia Supreme Court decision where one of the Justices had received a $3 million campaign contribution from one of the parties in the case and who went on to vote in favor of the contributor. At the end of the video viewers are asked to respond and leave their comments online or to a 1-800-867-7777 number regarding the practice of Judges receiving payments or contributions from interested parties in litigation before them. T.J. Johnston and Leslie Dutton, producersThe Emmy Award-winning, twice nominated, Full Disclosure Network (R) programs have been produced by Host Leslie Dutton and Producer T.J. Johnston. In 2002, the series "L.A.'s War on Terrorism" was recognized with a public affairs Emmy award by the Academy of Television Arts and Sciences.